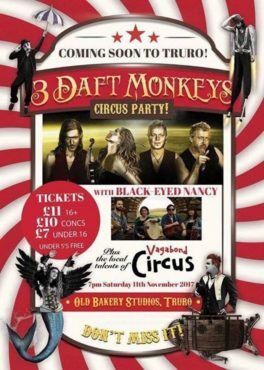 Bringing vibrant and sparkling new songs from their recently released album Year of the Clown, festival favourites 3 Daft Monkeys perform a brand new set of their quirky, original and upbeat fiddle-driven tunes. Now with a 4-piece line-up, the band is taking their famously dynamic live show to new danceable dizzy heights. With Celtic and Eastern influences, the 3 Daft Monkeys’ style of world folk music reflects the global village in which we now live. Their infectious dancing rhythms lead you through a musical journey of the senses and emotions, and will leave you breathless, enthralled and exhilarated. Black Eyed Nancy are a progressive alliance consisting of guitar, voice, melodeon, fiddle, viola, flute, double bass, bodhran and other exciting bolt-ons. Merging new concepts and traditional folk elements in their stunning originals and edgy variations on Cornish folk classics. Currently performing locally in and around Illogan, with the aim to corrupt other Cornish towns in the near future. Vagabond Circus is a company created and run by the youth. We aim to bring an alternative message to peoples lives through our creative expression of theatre, dance and above all, contemporary circus. We have many performers and each have performed in different professional environments such as the Eden project (in Cornwall, UK), alongside international performers and many UK festivals and events. We have a wide range of acts such as fire, acro, aerial, manipulation, dance and many many others. SEE YOU ON SATURDAY – GET YOUR DANCING SHOES ON!